There are many fractured families in the world, and each of them has its own story to share. 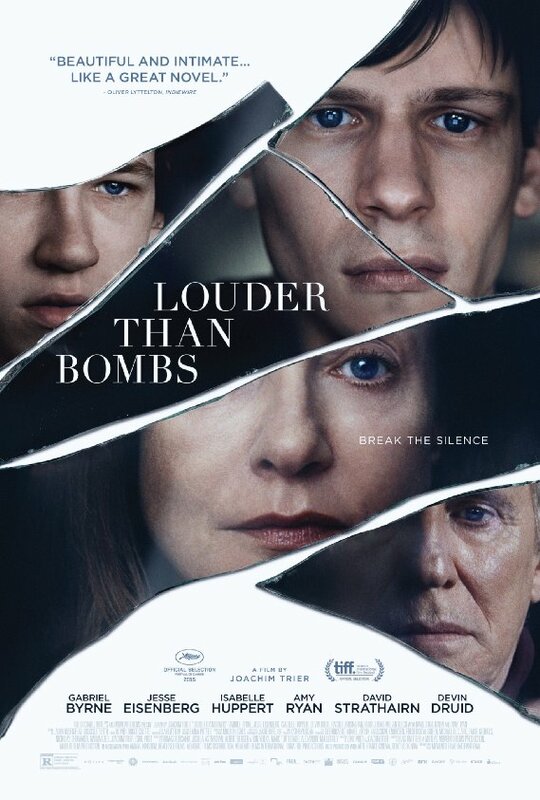 Despite Joachim Trier’s “Louder Than Bombs” not being based on one of those, it still touches a subject that some of us are still going through. It tells the story of three men remembering one woman in different ways. One still tries to cope with the loss. Another one tries to find a way to reconnect with the family. The third one finds it too difficult to handle the past that makes him to distance himself from the loved ones. An upcoming exhibition of celebrating photographer Isabelle Reed marks three years of her death. While the reason of that cruel car accident that took her life so soon is still unclear in the beginning of the film, however, the sound of it still reaches her two sons and husband’s ears louder than bombs. The upcoming event brings her eldest son Jonah (Jesse Eisenberg) back to family. During those days, the young man is forced to find a pulse of relationship with his father Gene and his withdrawn brother, Conrad, who seems to find joy in playing violent games more than communicating with his own father. With the help of flashbacks, Trier cleverly draws the line between the past and the present allowing the viewer to walk though it to better understand the characters. Gene Reed played by Gabriel Byrne appears as a caring father who gave up his acting career to be closer to his kids. As he struggles to find a way to connect with his two sons, it is however up to Jonah and Conrad to decide whether they want to rebuild the family or leave it as is – broken. It is also interesting to see Jonah, who in one of the scenes says to his father: “I was closer to my Mom more than you can imagine. When she did not talk to you, she did it with me.” However, despite that closeness, no one could not notice Isabelle Reed’s (Isabelle Huppert) loneliness and depression. But the most interesting, vibrant and unpredictable character in Trier’s film is Conrad who seems to hold the main key to the reunification of his family. While he makes it impossible to approach him to talk about the past and his beloved mother, it’s Isabelle Reed’s photography that speaks for everyone. “Louder than Bombs” is a film made only for the thinking audience. Having an intentional slow pace, the filmmaker creates a unique space that allows all three strong leading characters to fit into it. The story itself also develops quickly, but sometimes it takes you back to the same scene filmed from different angles, giving you a different point of view that represents each character. It’s also an optimistic film about how three men try to find peace living under the same roof, and finally to resolve a long-waited dispute over Isabelle’s death. Looks a nice movie, I would also love to see this one soon. Hopefully…!